Busted with 267 pounds of pot and a DD214 that says ‘US citizen.' Should this Marine have been deported? 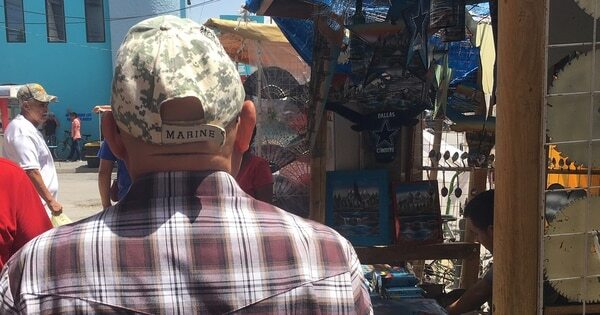 NUEVO PROGRESO, Mexico ― Marine Corps Vietnam veteran Jose Maria Martinez is not your typical deported immigrant. First, he doesn’t want your sympathy. He was busted in 1997 at a South Texas border checkpoint with 267 pounds of marijuana in his car. “I screwed up, it was bad. It was so bad it pisses me off sometimes,” Martinez said. He’s an ardent Trump supporter and cheers at the thought of a wall. In our in-person encounter, he made clear that reporters, save for Fox, were purveyors of “fake news.” His personal views on former President Barack Obama landed him in Facebook jail. He takes a hard line on those who are in the U.S. illegally. To the day he was deported, he thought he was a U.S. citizen. It was February 2002. He’d just completed five years in federal prison for the drug bust. He’d served his time. Martinez was ready to be released, start over. Instead, immigration agents walked into his holding cell in Oakdale, Louisiana. “They said they were going to deport me,” Martinez said. But when the U.S. Immigration and Naturalization Service looked at his records, it found nothing in the files to support that he’d completed the naturalization process, an official said on the condition of not being named. “According to government records, Sgt. Martinez did not qualify for citizenship or naturalization. After his arrest and incarceration for the aggravated felony, the Department of Justice deported him under Section 237(a)(2)(A)(iii) of the [Immigration and Naturalization Act]: convicted of a crime for which a sentence of one year or longer was imposed," the official said. At his 2002 deportation hearing, Martinez said the judge told him he had a case and could probably win, but he’d have to go back to jail to wait for a hearing, which might take two years. Martinez' other option was to be deported. Two more years incarcerated, after five years in prison. “No way,” Martinez said. He wanted to be free. In the second week of March 2002, agents walked him across the bridge into Mexico. He had $187 and the clothes on his back. He made a quick plan to survive. He bought tacos, then a lawnmower. To understand how Martinez thought he was a U.S. citizen requires some backtracking. Martinez was one of five kids born in Matamoros, Mexico. Their mother died in 1951 giving birth to the youngest. A close friend adopted all five, obtained visas and she and her husband brought the children to Texas in 1956 to raise them. Their adoptive mother became a U.S. citizen shortly before she died in 2000. Two of the boys, Jose Maria Martinez, and his elder brother, Jose E. Martinez, joined the military but followed wildly different paths. The elder Jose E. Martinez joined in the Air Force, served for 20 years and became a U.S. citizen. He served on the Senate Armed Services Committee as a professional staff member and was later appointed by President George H. W. Bush to be an assistant to the president on personnel and national security matters, then directed Bush’s trade and development program. The younger son, Jose Maria Martinez was attracted to a rougher life. He wanted be in the military, too, but be a Marine. He craved fighting and was expelled from high school in the 10th grade after getting into five fights in a single day. In 1966, at the age of 17, he convinced his adoptive parents to sign the consent forms to allow him to enlist early. “I took the oath in San Antonio and got on a plane to San Diego,” he said. He was assigned as an infantryman and mortar man and deployed in 1967 to Vietnam with Alpha Company, 1st Battalion, 4th Marines, 3rd Marine Division. He and several other Marines started naturalization classes, Martinez said, but then they were pulled into operations. Martinez was just 18 years old when his battalion engaged at Con Thien, a desperate and drawn-out firefight near the North Vietnamese border. He rattles off others: Cam Lo. The Washout. Crossing the Ben-Hai. His memory flashes from firefights to mortars to carrying dead and wounded to the landing zone. He remembers a final exchange with a badly wounded Marine at the LZ after offering him a light. Would the cigarette extinguish before he died? Martinez wiped his eyes. He did. But he’d asked for that life, Martinez said. “I’m a grunt,” he said. His older brother also served in the war through the Air Force, but admits their experiences were vastly different. “What [Jose Maria] went through in Vietnam, I don’t wish on anyone,” his brother said. When Martinez got back from Vietnam, he could not detoxify or stabilize. The Marines assigned him to man the brig, then to teach combat tactics to new infantrymen. After a heavy night of drinking out at bars near Camp Pendleton, Martinez got into a violent fight. An Oceanside police officer responded; Martinez said he never identified himself as a cop. Martinez hit him, too, cracking the officer’s jaw. He spent six months in state prison. After that, the military gave Martinez a general discharge under honorable conditions in 1972. His DD214, that all-important discharge paper that sums up a service member’s career, said U.S. citizen, Martinez didn’t question it. Martinez slipped through the cracks. There was no post-war PTSD counseling, and the clerical error cost him the awareness that his citizenship was not complete and still required him to do more work to get it done, said his daughter Marina Herrera. Martinez worked on building that “normal life,” but was unstable. His first wife learned to wake him from a distance with a broom. Another time he woke up underneath their house. His wife decided it was safer to leave him there. “You were yelling, ‘incoming!’” She said. He doesn’t remember that. Martinez got a manufacturing job in Texas and got promoted to manager with a $65,000 paycheck. Each step of the way, his DD214 was accepted as proof of citizenship. Martinez maintained all the trappings that he viewed as part of that duty. He paid his taxes. Voted Republican. Served on juries. It wasn’t enough. A second marriage failed. He kept looking for a high. When Martinez was tempted with an offer to start ferrying drugs across the Texas-Mexico border, he jumped. “The adrenaline [from making the border crossing] was so high. I hadn’t had that adrenaline high since I was in war. It’s the best drug in the world. I looked for it,” Martinez said. All of that came to a halt at the Sarita, Texas, border patrol checkpoint in September 1997. Martinez is now 69, and he’s spent the last 16 years in Mexico. He is still Marine to his core. He works out in the dark each morning, before the rest of the town wakes. He pushes five sets of 55 crunches and runs the plaza of Progreso, Mexico, a hot and dusty border town of bars, pharmacies and street vendors. He only allows himself to drink on Saturdays, the night he goes out dancing. The rest of the week is work, home, and hard exercise, "in case I can be of service to the Marine Corps again,” he said. Martinez does not want favors, he wants what’s his. “I was never illegally in the United States. Never, ever, ever, ever,” Martinez said. What deportation has cost Martinez — and the questions surrounding how INS agents and an immigration judge handled his case — continue to drive his children and family and a legislator to help bring him home. Herrera has difficulty understanding how someone who served the country in combat could be left to fail, when it was clear her father needed help. The whole family acknowledges the severity of the drug charges, but emphasizes that Martinez did not hurt anyone but himself. “Had he committed an offence that was unforgivable or incredibly heinous, we would all have accepted his fate and left it at that. However, that’s not the case,” Herrera said. Her father is more circumspect. Attorney Elizabeth Ricci, who has been consulting with Martinez' family, thinks there’s a chance he could be allowed to return to the U.S., based on a 2010 Supreme Court decision that found non-citizen defendants must be informed of the deportation consequences of a guilty plea. Martinez has said that never occurred during his 1998 drug trial in Corpus Christi, Texas. Military citizenship paperwork errors are common, Ricci said. She’s had at least a dozen military clients deal with the same issue. Herrera is trying to get her aging father home. Martinez' brother, too, is still working to get him home, and still seems uncomfortable with how his brother’s life turned out, given his own political fortune. 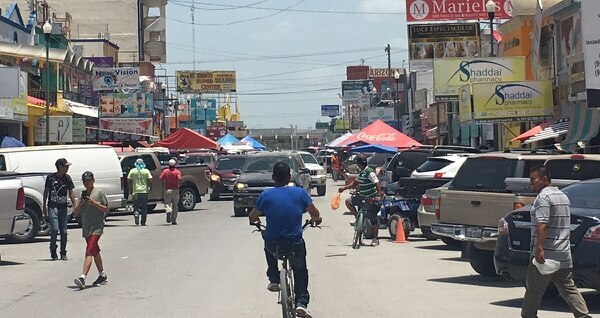 These days, Jose Maria Martinez runs a small cell phone shop along Progreso’s main street. His shop is dotted with pre-paid calling cards and decorated with Marine Corps flags. Veteran friends travel to visit; Martinez threw Progreso’s first Marine Corps birthday last year and he’s got another planned for this Nov. 10. Rep. Vicente Gonzalez, D-Texas, has talked about Martinez' case with President Donald Trump. 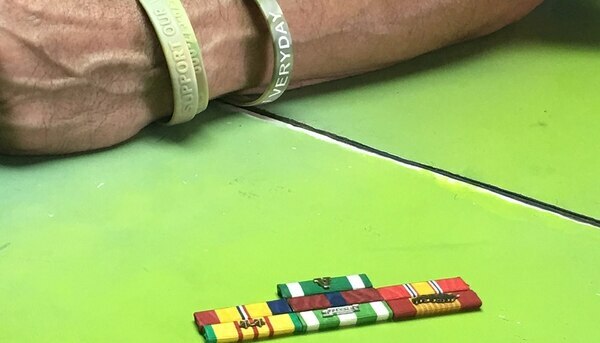 He believes the Marine’s life would have taken a different path if he’d had help adjusting after the war, and he’s trying to get legislation passed that would allow Martinez and other vets like him to come home. Martinez’ last bad stretch of nightmares occurred in 2016. He could only sleep one to two hours at a time. He’d push his runs to 3:30 a.m. to try and tire himself out. Martinez can’t see a doctor for help with the PTSD because he can’t access VA health care. He used to keep a .22 handgun under the store counter for self-protection but couldn’t stop thinking about turning it on himself. He tossed the gun and keeps a machete there now instead. More than anything else, he is still a Marine.